Regenerative medicine is the way of the future for Canadian health care, Prime Minister Justin Trudeau said, and two new initiatives are helping strengthen the commitment of U of T and its partners to stem cell research and manufacturing. Trudeau announced at the MaRS Discovery District on Jan. 13 that the federal government will give a $20 million grant to the Centre for Commercialization of Regenerative Medicine (CCRM) to establish and operate a new Centre for Advanced Therapeutic Cell Technologies. At the same time, Vivek Goel, vice-president, research and innovation at U of T, announced that Professor Peter Zandstra, a principal investigator in the Donnelly Centre and Chief Scientific Officer for the CCRM, has become the inaugural director of Medicine by Design. The CCRM is the commercial arm of Medicine by Design, a program created last year through a $114 million grant from the federal government. Read more about Medicine by Design. 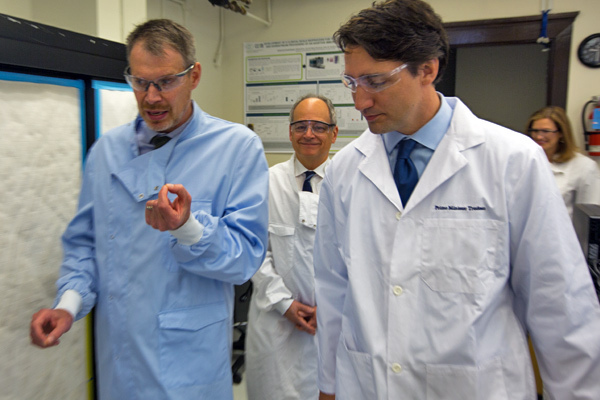 Trudeau toured two CCRM labs at the Banting Institute with Zandstra, U of T President Meric Gertler and Michael May, the president and CEO of CCRM, along with Navdeep Bains, Minister of Innovation, Science and Economic Development, and Chrystia Freeland, Minister of International Trade and MP for University-Rosedale. The group then moved across College St. to MaRS, which will become the new home of the CCRM later this year. The bottom line, he said, is that “we must do more to prevent diseases” and the collaboration between public institutions like U of T and its partner hospitals, the private sector and government is crucial in “accelerating the development” of stem cell manufacturing technologies. GE Healthcare is also committing $20 million to the new centre. Kieran Murphy, CEO of GE Healthcare’s life sciences business, said in a news release that “it is increasingly clear that cell therapies and regenerative medicine will transform health care globally, but successful industrialization is now crucial to widespread adoption". It is expected that the global market for cell-based therapies will surpass $20 billion U.S. by 2025. The main targets for cell-based therapies are cancer, heart disease, neurodegenerative diseases, musculoskeletal disorder and autoimmune diseases. Trudeau noted that the new centre will be the first in the world to use a collaborative approach between research institutions and industry to solve cell therapy manufacturing challenges. He said the centre will create jobs, strengthen Canada’s knowledge economy and position Ontario as a global hub for the cell therapy industry. Zandstra is a professor in U of T's Donnelly Centre and in the Institute of Biomaterials & Biomedical Engineering, holds the Canada Research Chair in Stem Cell Bioengineering. He told U of T News he is thrilled to be the executive director of Medicine by Design. “But the big news today is the funding of the new centre. We are very thankful” for the government’s commitment. It was formed as a result of the University of Toronto’s success in the Canada First Research Excellence Fund (CFREF). The $114 million will be spread over seven years, and will allow U of T and its partners to build on years of support for U of T’s regenerative medicine researchers from federal granting councils, the Canada Foundation for Innovation and support from the Canada Research Chairs and Canada Excellence Research Chairs programs. Zandstra will lead and provide over-all scientific direction to the Medicine by Design initiative. May, CEO of the CCRM, said the new centre is a “significant milestone” in the fight to find cures for diseases and to create companies that will bring those cures to the marketplace. And he reminded everyone that the incredible advances in stem cell therapy and its application “trace back to the discovery of stem cells 65 years ago” by U of T scientists James Till and Ernest McCulloch.